Obligatory warning: If you’re a new listener to 7S, consider hitting the “back” button.This page describes plot elements in chapter 4 of Book Two: Deceit. If you haven’t made it to this point in the 7th Son trilogy — and if you want to be surprised by the story — it’s best to leave this page unread. Don’t worry: It’ll still be here when you listen to Chapter 4. Come back then. In the fourth chapter of Deceit, the Beta clones examine ten encrypted clues left by John Alpha. They quickly discover the clues are encoded in a cryptogram — a word puzzle that substitutes one letter of the alphabet for another. While the clones decoded the messages by the end of the chapter, this page is for 7th Son fans who’d like to see the encrypted clues (and the dog tag glyph that contained the cipher) and solve the puzzles themselves. The clones discovered the cipher letters in the “vaguely Satanic” glyph, found on the bodies of the NEPTH-charge victims. 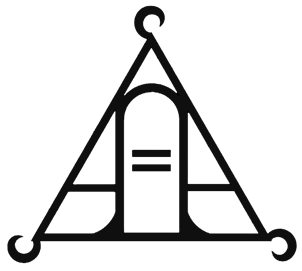 They first viewed the glyph rightside-up … and then upside-down … to unlock the messages’ secrets. Special thanks to Sarah and Tim for catching a few typos in the encrypted messages! 7th Son fans rock!